This plugin is available for 3ds Max 2015+. Added option to Skip Selected Faces. Fixed bug in Use Selected Vertices. Fixed faces being skipped when By Polygon is on and the faces in polygon were not planar. Fixed some problems with Delete Faces. Fixed isolated vertices not being deleted. Added button in Custom Attribute to delete the rollout when it persists after the modifier list has been collapsed. Converted to C++ plugin with speed increases. Added new option to choose by smoothing groups based on: Match ANY, Match All or Match None. Added option to choose material ID or exlude by material ID. In 3ds Max 2017+ an object using this modifier is no longer selectable in the viewports. Workarounds include selecting via the Scene Explorer or to add a Vol. 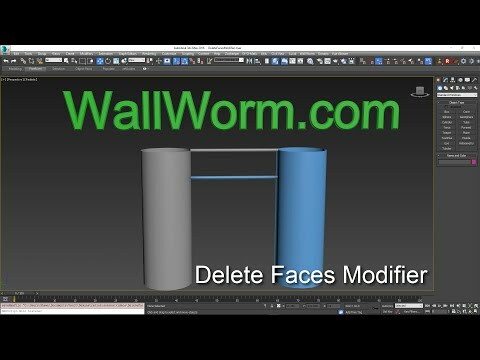 Select above the Delete Faces modifier. I am looking into fixing this issue.